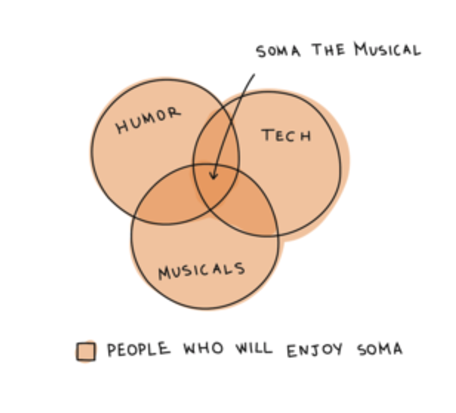 In this highlight, Sam and Pat from South of Market: The Musical teach me whatever about producing a musical entirely based on the tech scene’s most eventful moments of the year. It’s the second time this musical will run in San Francisco, and if you’re the type of person that’s into satire, tech or … at least humor, you’re in for a treat. Read the interview below, and see how you can get early access. 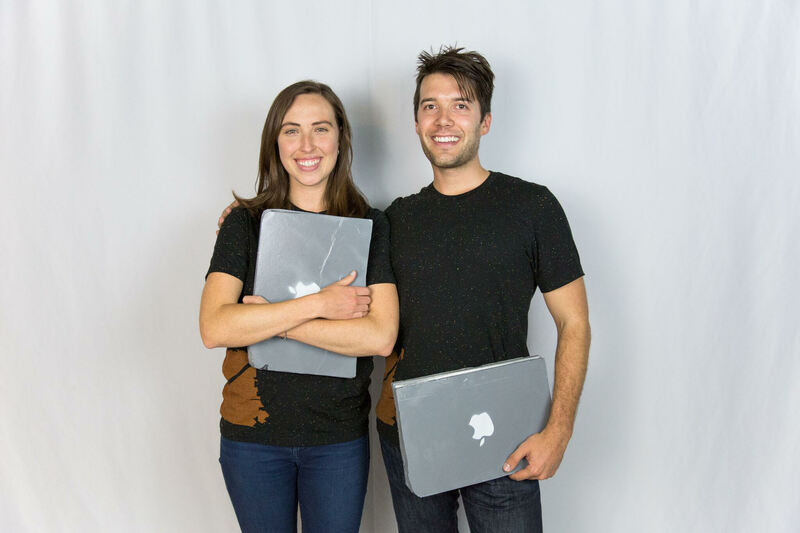 We met through a project for the Crunchies, the annual award show put on by TechCrunch. Pat was hired to write a musical opener to the show. Sam was an editor at TechCrunch at the time who wanted to bring a little Neil Patrick Harris flare into the event. Through this collaboration, we realized we had to build a tech musical. Pat brought theater experience from Columbia’s Varsity Show and performances at the Foxwoods Theatre in NYC. Sam, a lifelong musical fan, had been is truly immersed in tech having studied at MIT, participated in Y-Combinator and now working Google Cloud. We had the just the right combination to bring these worlds together. What 3 elements do you need to make a musical successful? 1) A story to tell. Musicals are one vehicle for storytelling. With any story, writers need to have a clear vision for the journey they want to take their audience during the course of the show. A successful musical requires a top notch writing team to create compelling characters. It requires music that is integral to moving the plot forward and choreography to express that music through movement. It requires set and costume design to bring this world to life. Musicals also require designers to build a brand, marketers to sell tickets and so many others!! For a new musical, the odds are very low that you get to a stage or ever make money. Much like a startup, there are infinite ways for you to fail. It takes constant commitment and creative problem solving to bring a show to life. Just this week we dealt with several jokes that needed rewrites, finding a piano for our composer, rehearsal space availability issues, website formatting problems and actors being sick going into rehearsals. What brands can you expect to be featured in this musical? How is this different from last year? Every year we want to tell the story of Silicon Valley to the people who know it best. In 2016, we told the story of a 29-and-3/4-year old founder who was having a mid-life crisis after not making ’30 Under 30′. This year, tech has been dealing with a number of serious topics – from diversity issues in venture capital and tech’s biggest companies to the impact of artificial intelligence. Does the show Silicon Valley HBO inspire you? Definitely. Sam was a consultant on season one of the show and it’s amazing how well a group of outsiders really understood our industry. It requires tons of research and diligent observation. Much of the SOMA team lives and breathes tech every day but we still encourage our writers to have conversations with different players in the industry to get more perspective. Why do you think people love satire around tech? I think there are some things that are just universal. How many times have you gotten an email that starts with “sorry for the delay”? They’re not sorry. They read it weeks ago. It’s just been sitting in their inbox and they finally felt like pushing it over to you. Actually, that’s not a bad idea for a song. How can someone reading this message make something similar happen? What’s the magic sauce? Start. Sam had no background in writing a show, selling tickets or being a prop master – all of which she did last year. Pat had never managed a large team or done a model for ticket pricing. If you wait to know everything you’ll never get anywhere. Plan to figure it out as you go. Also, seek out mentors. Most people are happy to share their expertise if you ask. We have been lucky to get great guidance from Apples and Oranges Studios – definitely check them out! Want to get 10% off tickets ahead of the public launch on September 13? Use my promo code TEACHMEWHATEVER at the check-out on their website to unlock early access , so you’re guaranteed a seat. Last year, the show sold out within 48 hours! You can also enter my give-away on Instagram. Do you have any questions for Pat and Sam? Do you have an idea for a next #teachmewhatever? Share your thoughts in the comment section, or connect on Twitter and Instagram.